“We have better teamwork, fewer accidents, less turnover, and management that is much more engaged,” Lewis said. 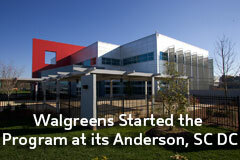 While trade press coverage of the program has been extensive, most of it has focused on the basics of what Walgreens has accomplished. We wanted to understand a lot more about the “how” of making this happen. That led to an interview with Randy Lewis, Senior VP of Distribution and Logistics at Walgreens, as well as key members of his logistics team: Keith Scarbrough, Distribution Center Manager at the Anderson, SC facility; Scott Sylvester, Distribution Center Manager at the Windsor, CT facility; and Deb Russell, Manager, Outreach and Employee Services for Walgreens. Walgreens has an aggressive goal with regard to employing the handicapped, with plans for eventually having at least 10% of the total distribution center workforce – or about 1000 employees across 14 DCs – come from handicapped employees. Right now, the number is already at about 700 disabled workers. At the Anderson facility, Scarbrough says that about 37% of employees are handicapped, a level reached since the new DC was opened in June, 2007. That facility was designed with Lewis’ original goals and ideas regarding this initiative in mind and, thus, was easier to get higher numbers of handicapped associates than it might be in some existing facilities built or leased long before the initiative was envisioned. However, Walgreens has been able to get the number up to 24% of employees in one leased DC building in Georgia that was not at all designed for the handicapped. Below, we capture some of the key insights that the Walgreens team has learned from the more than two years the program has been in place. Partnering with local agencies of some kind is critical, Walgreens says. To find a disabled workforce is not easy, the Walgreens team says, and certainly they did not have any core expertise in recruiting potential DC job candidates with disabilities. “One of our goals was to not become an expert in recruiting people with disabilities, but leveraging what is already out there in the communities,” Russell added. Most states and local markets have agencies that are focused on finding and training handicapped workers, but the capabilities, interests and approach can vary substantially across those organizations. For example, Walgreens has even found that it can work very well with Goodwill offices in some locations, but that in other areas, the local Goodwill organization has less interest. It takes work to find and build each local relationship, Walgreen’s stresses. “We’re interested in building quality relationships with agencies that are interested in building quality relationships with us,” says Russell. For the Anderson DC, after the initial recruits, the team later expanded its recruitment area from a single county to five surrounding counties to maintain a strong candidate stream. It has also partnered with some local school districts to identify potential future candidates. Russell said Walgreens tracks its success rate in terms of referrals versus eventual employment by partner agency; she also recommends bringing partners in for a fairly detailed review of DC operations and tasks, so they can get a better feel for the work and potential candidates. She also said the hiring rate from agency referrals is higher than for that of standard job applicants coming in on their own. 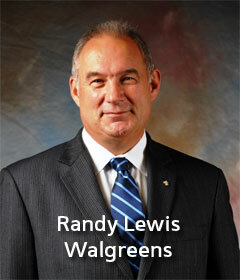 In conjunction with the local partner, candidates are identified to each Walgreens DC. Candidates cannot be forced, of course, to disclose their disability, though most do. “You look at someone’s skills or their ability, and you match them to the right job, just like you do for a person without disabilities,” Scarbrough added. Lewis said that early on Walgreens decided not to try to achieve so-called “universal access” that would allow disabled employees to move and work anywhere in the building. This, of course, in practice, means that some disabled workers cannot get to certain areas to do certain jobs, but this has really not had a major impact of any kind on the success of the program, and empowered it by keeping investment costs modest, even as some disabled advocates pressed for universal access. In some cases, however, Walgreens has made additional accommodations, such as adding a lift up to a mezzanine. In other cases, it takes a pragmatic approach – if a wheelchair needs lifted and moved to get someone into the right place, that’s simply what the DC team does. In a couple of cases, Walgreens has had to add some more handicapped parking based on the number of employees with permits, but Russell said they have had no complaints from other workers that they were “losing parking spaces” or any other issues. When the Anderson DC was being designed, the first consideration was building the most efficient building and processes first, Lewis said. Then, they looked at places where they might make some modest changes to accommodate the disabled – but, in the end, that usually wound up being to the benefit of the entire process. He said the biggest accommodations probably related to “paper and pencil,” meaning some changes to job training. He said that in existing buildings, the program is being successful despite no real physical accommodations for the disabled in those DCs. Software (WMS, WCS, etc.) plays a critical role in most high throughput distribution centers. 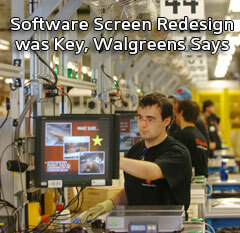 To make its DC operations more accessible to disabled workers, Walgreens needed to rethink the design of its existing software systems. “We needed to make the screens simpler, get rid of keyboards where we could, use symbols instead of words wherever possible,” Lewis noted. “Existing computer screens and interfaces are probably the biggest barriers to employing the disabled,” Scarbrough added. The interesting side benefit is that such changes can actually improve usability even for non-disabled associates. That even includes fork truck drivers. “We might have someone with limited mobility driving a lift truck, or even a cognitive disability,” Sylvester said of the DC in Connecticut. The goal of the program, Lewis said, is to fully integrate the disabled in every way into DC operations. “They are working side by side with the non-disabled, have the same pay, the same jobs, the same standards,” he said. Walgreens says that there were not really any significant legal or regulatory barriers to moving ahead with the program – the biggest obstacle for them or any company is likely to be internal perceptions in the company. “People were worried we were going to have more accidents, insurance was going to go up, non-disabled people wouldn’t want to work around people with disabilities, things like that,” Lewis said. Just the opposite turned out to be the case, he said: accidents and costs have actually decreased, and it has created more of a sense of teamwork. “We found all the prejudices to just not be true,” Lewis added. Companies pursuing such a program will undoubtedly find some unexpected challenges, Walgreens says. One it ran into had to do with “bidding” for new job openings. In general, workers often start out on night shifts, and bid to get the more desirable first-shift openings when a spot opens up. 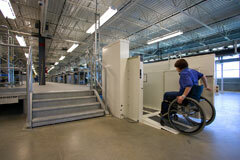 However, many disabled workers cannot arrange transportation outside of normal business hours. That meant that the program might be torpedoed, because as there was turnover among the disabled workers that started out in the new Anderson building, bids would be won by non-disabled workers on the off shifts; eventually, there would be few disabled workers at all. So, Walgreens created some non-biddable positions. While Lewis says that did create some concerns that the approach was not “fair,” in the end, it was recognized as being essential to achieving its goals with the program. He also said that while you can’t “discriminate” in most circumstances against the disabled, you can, in fact, do so against the able-bodied. In the end, the non-biddable positions approach has worked well, Lewis said. While the potential for financial incentives to hire disabled workers was not at all a factor in terms of the decision to go ahead with the program, Walgreens says there may be some available incentives to increase the benefits of the move. “There are tax credits for companies that employee people that fall within six different categories of disabilities,” Russell said. She also said that there is a program called “Ticket to Work” that provides incentives for awhile when a company hires someone who then moves from receiving Social Security benefits to being independent. There may also be individual state programs. However, Russell says some of these incentive programs are growing more complex, and may not be worth the effort. “We’re focused on employing people, not dealing with the bureaucracy,” she said. While the approach of DC managers and supervisors needs to change in some ways with this type of program, those changes are nothing but positive, the Walgreens team says. Hiring the disabled doesn’t mean you have to keep every employee regardless as to how they are performing – in fact, building the program with the capability to determine it just can’t work for some hires is essential for the total program’s success. In the end, Lewis says the program has had a neutral impact on productivity (it has remained the same), and that the benefits overall have far outweighed the investment, which has mostly been in management time and attention to the program, plus the software modifications. “This is one of the best things we have ever done,” he added. What’s your reaction to the Walgreens’ program? Should more logistics organizations be pursuing this path? What concerns – real or perceptual – do you think managers and employees would have? Let us know your thoughts at the Feedback button below.